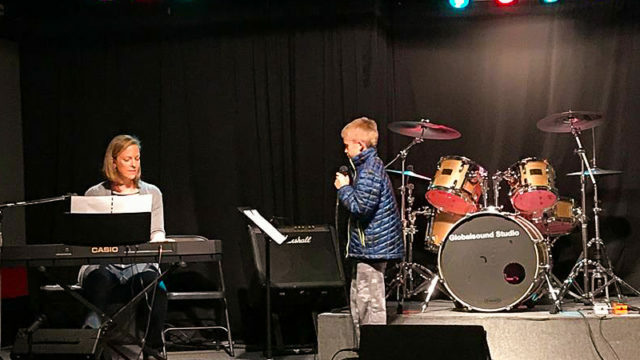 April 12, 2019 / Meaghan Lillis / Academy of Rock, Music Summer Camps, News & Events, Tips for parents, Tips for students, Why study music? Private lessons teach you a lot about an instrument. You’ll learn basic techniques, build a repertoire of songs – maybe even have a few recitals. Given all that private lessons teach you, why bother playing with other musicians? Short answer: because it’s AWESOME! Long answer: Because nothing teaches you more about being a musician than playing in a band! Private lessons help develop essential skills but bringing those skills to a rock band will take your musicianship to the next level. Not only that but you’ll make friends and connections with other musicians that can last a lifetime! Think you’ve got rhythm that rivals the steadiest metronome? Are your riffs in tune and on point? Can you correctly project your voice and maintain energy through a setlist of songs? You’ll find out for sure once you start playing with other musicians. Placing your musical skills in a group context will reveal both your strengths as a player and the areas that need fine tuning. Being able to integrate your playing into a band or ensemble setting is a vital step for musicians to take. Key abilities, such as playing in rhythm and singing in key, will develop exponentially the more you play in group setting. Playing with others also exposes you to musicians at different skill levels than yourself. You might be inspired to up your practice game when you see how awesome your bass player or drummer is at their instrument! It’s true that some people are born performers. However, even the most natural stars need to work on their performance abilities. Musicians develop stage presence over time and through LOTS of repetition. But getting up on stage for the first time can be intimidating, especially if you are playing solo. A good way to begin conquering stage jitters is to play with other musicians. Being onstage alone is more daunting than being onstage with a group of friends. Multiple musicians means a fuller arrangement, with less pressure put upon any one musician. Plus, you’ll have emotional support and comradery from your bandmates during your shows! Being in a band exposes you to instruments that you might never see up close otherwise. If you’ve been curious about learning another instrument, your fellow bandmates can give your pointers or recommend an instructor – maybe even let you try out their instrument during practice! Understanding the basics of a variety of instruments is important to your overall musicianship, regardless of what instrument you play. Being in a band is a great way to begin learning those basics, along with other important tips and tricks. You might learn how to break down the hardware for a drum kit or see what kind of pedals it takes to get a great guitar tone. Plus, exposure to other musicians sparks creativity. You may not consider yourself a singer but you might be inspired to add backup vocals to a song after hearing your vocalist rock out during rehearsal! Being in a band teaching you how to work with others, just like any group collaboration. You’ll learn how to compromise, respect, and constructively communicate with your bandmates. You’ll build unique bonding experiences during rehearsal and performances. You’ll work together towards common goals and develop good practice habits by following through with rehearsal commitments and practice routines. The way you play a song changes when you start playing it with others vs by yourself. Playing in a band teaches you how to complement your bandmates (not just play whatever strikes your fancy) while creating musical moments that let each other shine. Have we mentioned – being in a band is FUN! You get to hang out with friends, play songs you love, write songs together and perform them in front of your friends, family and fans. You get a moment to shine on stage with the support and connection of your bandmates. Being in a band creates friendships and memories that last a lifetime! Interested in playing in a band? Globalsound Studio’s rock band program has everything you need to get you rocking with your peers. Learn more about our rock band program here. Summer Camp Rocks – Westminster, Broomfield Area!